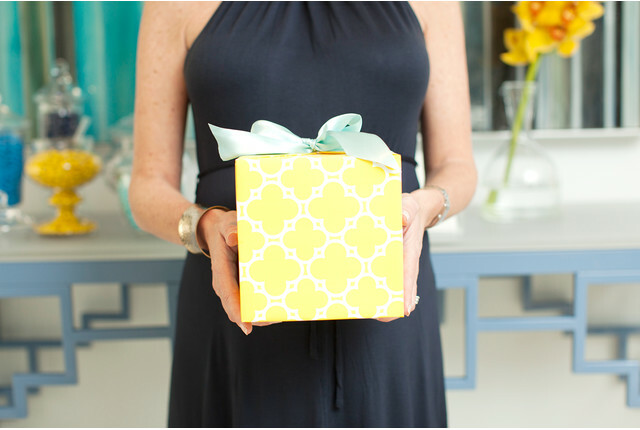 "I just loved all of the personal elements that were incorporated into the shower. The hostesses are some of my favorite gals and they know me so well. My work family is truly that - a second family, so it was just such a special memory to have all of us together. 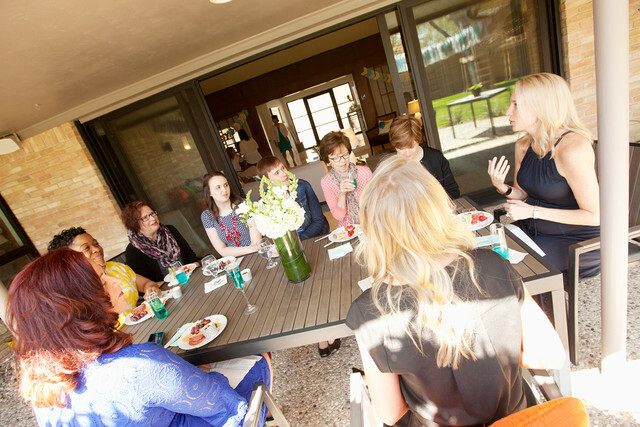 It was an amazing moment that I'll forever cherish," said the mom-to-be. 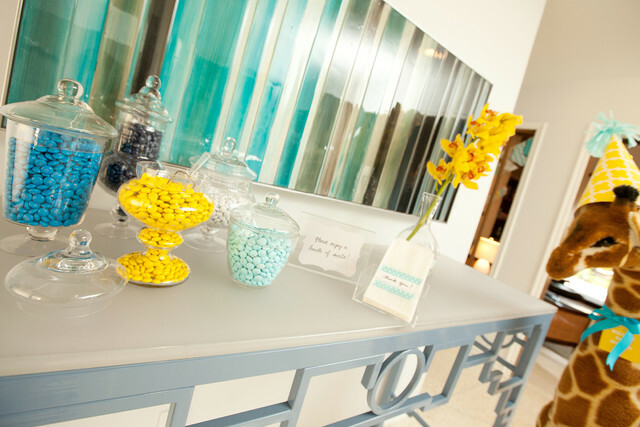 Yellow and aqua provided a consistent color theme throughout Melissa's home. 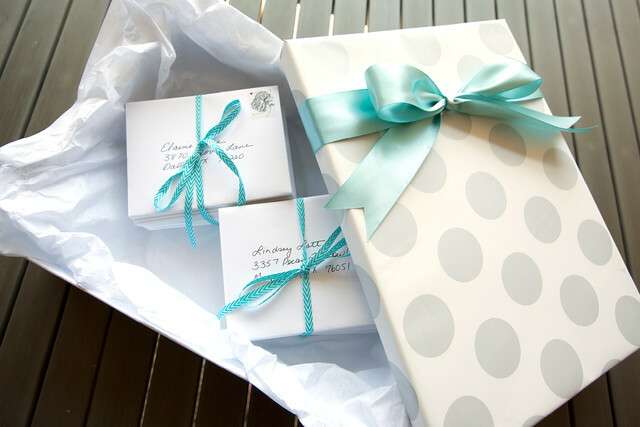 Boxes wrapped in graphic gift wrap and beautiful bows were abundant. 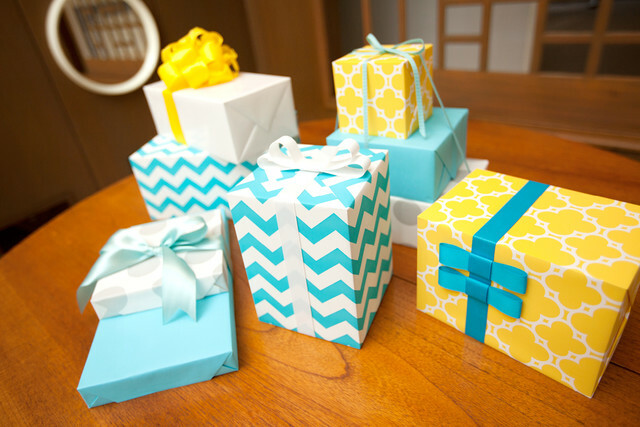 The girls used that same gift wrap to create a festive chevron garland that welcomed guests as they arrived in the foyer, as well as over the fireplace where Kelley opened gifts. 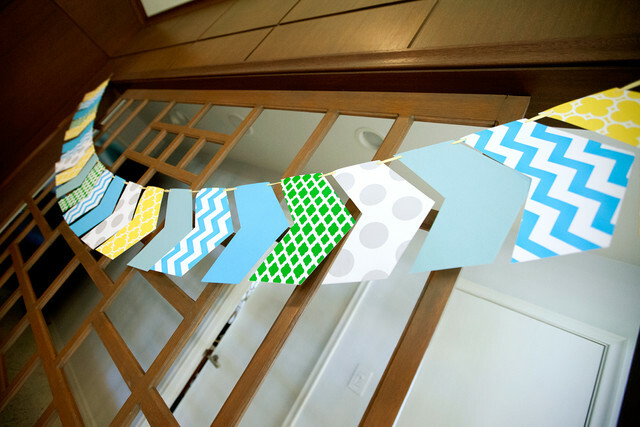 To make your own, check out our Chevron Garland template here. Mother Nature knew this mom-to-be would love to dine al fresco if possible, and the weather made it easy to do just that. 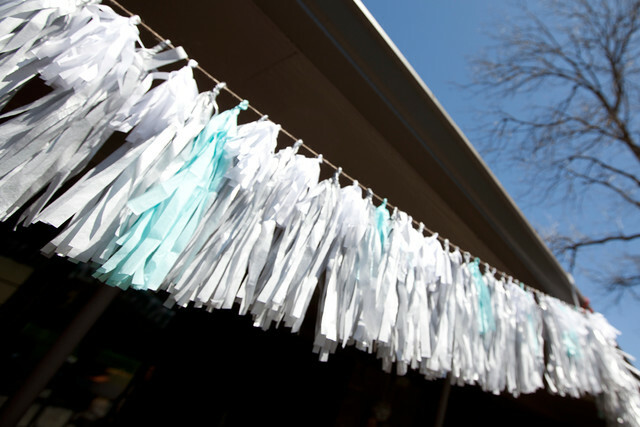 A Tissue Paper Tassel Garland blew in the wind adding a touch of whimsy and a soothing sound. To make yours, download our Tassel Garland template here. 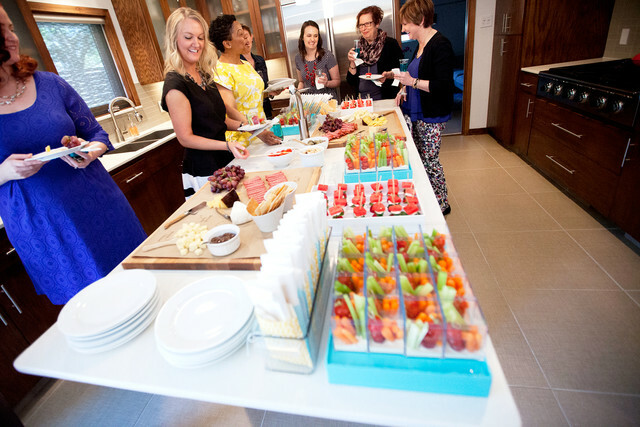 And the food was simply divine - easy pick-up noshes that could be enjoyed with a fun beverage and a lot of chatting - creatively displayed in - what else? 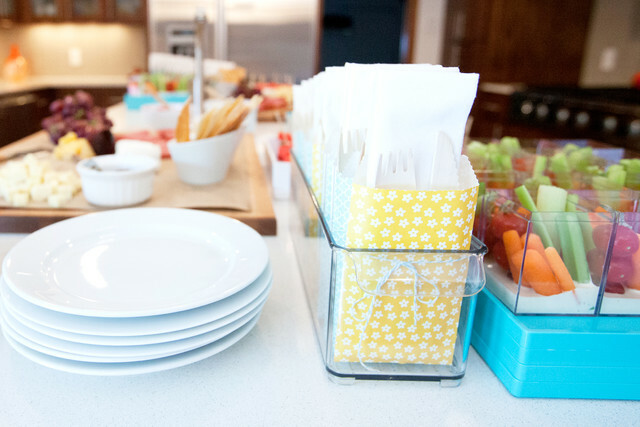 - a variety of containers of course! 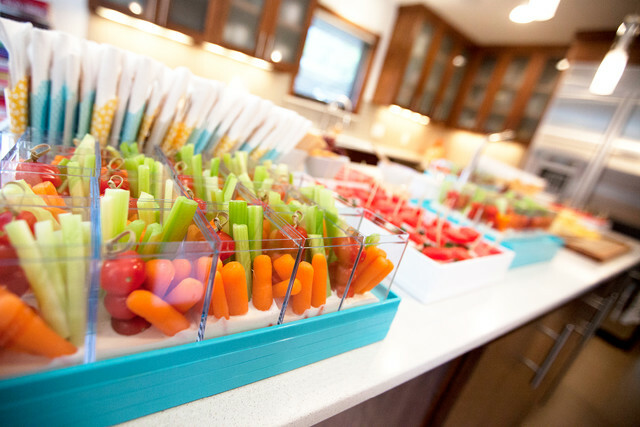 Coordinating trays were the perfect vessel to orderly display personal crudité - with dip at the base of each Amac box. 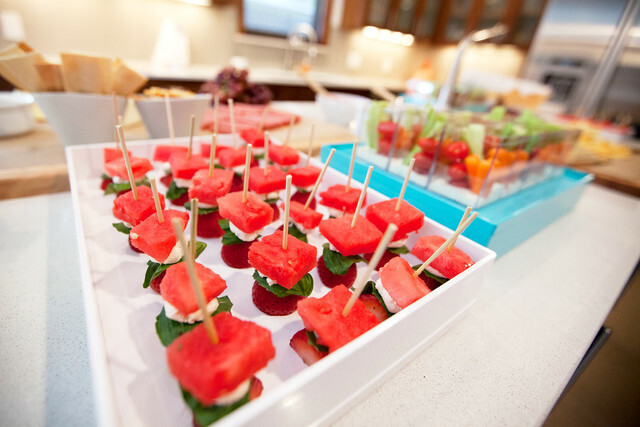 Layer the watermelon cube, basil leaf [if the leaves are large cut in half], goat cheese, strawberry, then skewer together with a toothpick. Top with a drizzle of honey just before serving. 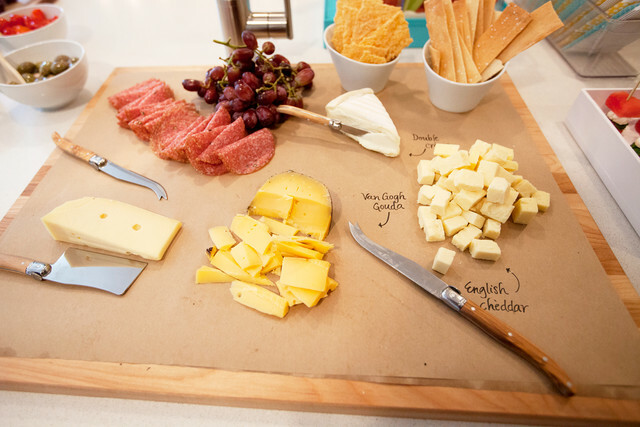 A rustic charcuterie provided savory nibbles for guests with handwritten descriptions written directly on the craft paper-covered wooden cheese board. 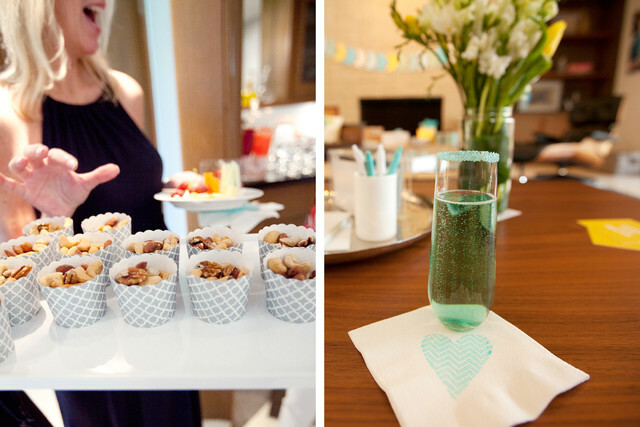 Baking cups filled with a mix of nuts complimented the signature Blue Star cocktail, which was a mix of vodka, cointreau and blue curacao in a flute with a sugared rim. Hostesses Audrey, Lindsey and Melissa toast their longtime friend and colleague with best wishes for Kelley and the family. Kelley admits she doesn't just crave ice cream when she's pregnant. 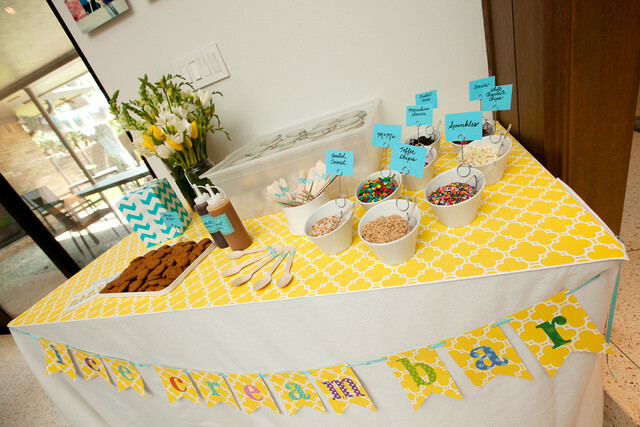 So she, of course, loved the addition of the cool make-your-own sundae bar. 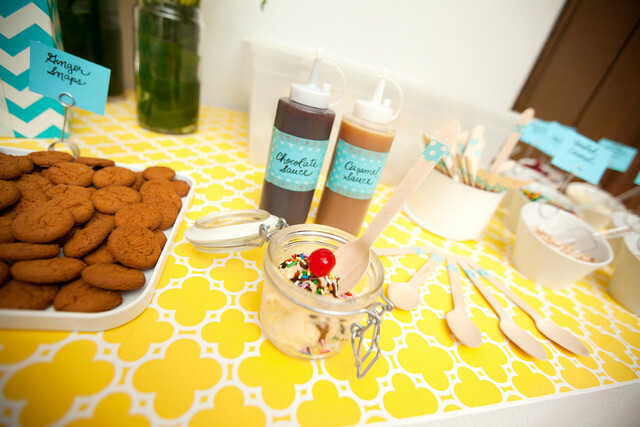 A mix of jars, bottles and containers provided the perfect way to serve up toppings and treats galore. 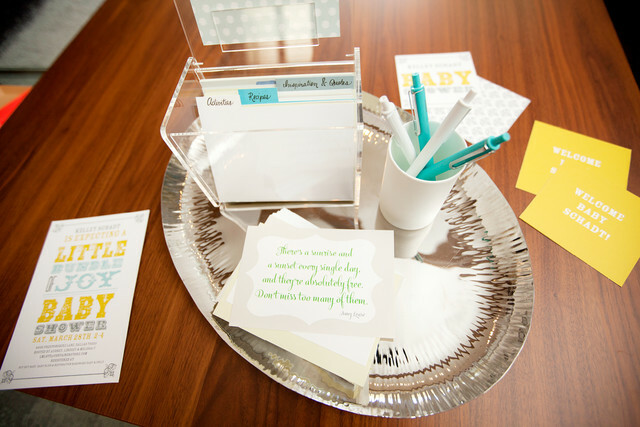 Guests were encouraged to fill up a recipe box with favorite quotes, recipes and things for the family to do on the weekends once the baby arrives. 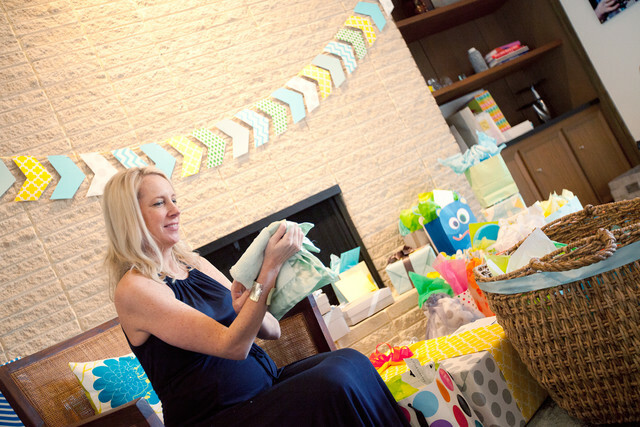 It was a touching parting gift that would be enjoyed by Kelley, her husband Brian and baby Max long after the party was over. 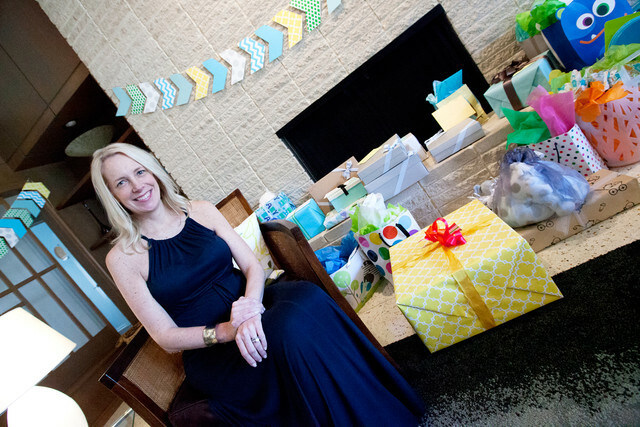 Kelley loved each and every gift she received - from the teeny clothes and practical must-haves, to giraffe themed presents that would be sprinkled throughout the nursery (like a wooden giraffe clock) inspired by her husband Brian's childhood stuffed animal "Raffy." But she does say that perhaps one of the greatest gifts was from the hostesses - thank you cards already addressed and stamped to every guest. 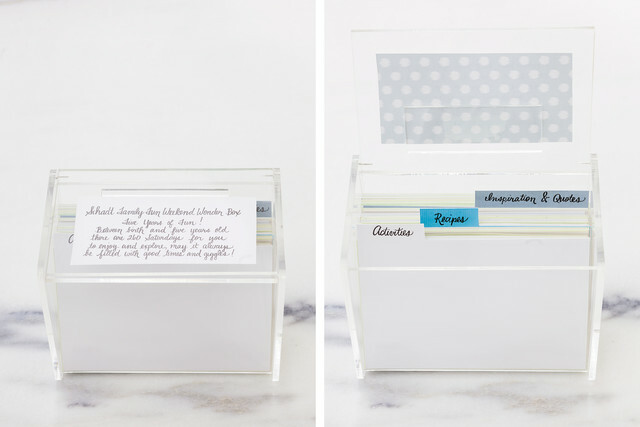 "They were ready to go as soon as I wrote the notes. 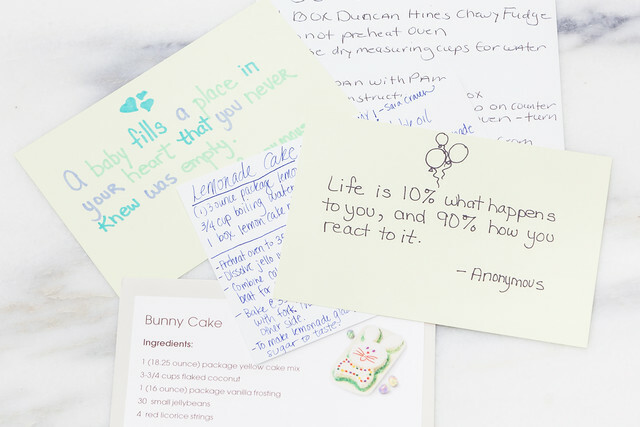 It was such a neat surprise and so helpful - it made the process of writing so many thank you's so much simpler and alleviated a ton of stress," Kelley added. 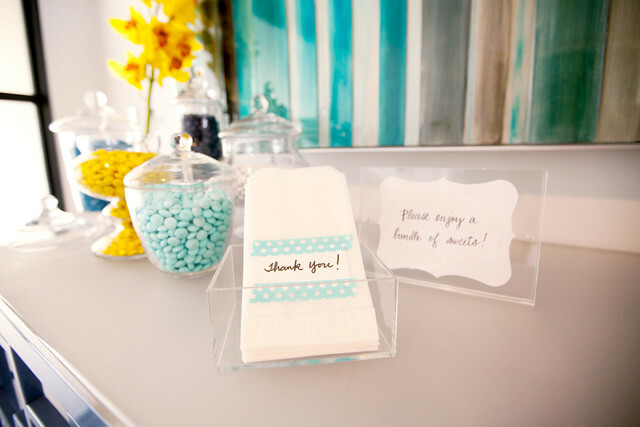 The sweetness continued as guests said their goodbyes and parting well wishes for mom and baby as they filled paper gift sacks with color M&Ms that were housed in beautiful jars of varying shapes and heights. A perfect treat to remember the sweet day of celebration!